Get the Full StoryAnytime we see pink sneakers, we automatically perk up. I mean, getting yourself motivated to work out is tough enough, and we need all the help we can get. Enter these super fun Nike Roshe Run Print Sneakers 85 . Not only are they pink, they're also metallic, giving them an almost rose gold hue. Can you say swoon? 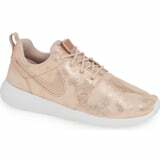 In addition to being seriously adorable, these sneakers are comfortable, and the perfect option if you're headed straight from working out to brunch with your girlfriends. They're great for shorter runs or training sessions, and offer a supportive, cushioned ride. These cute, colorful options will liven up your workout wardrobe, and actually make getting to the gym just a touch easier. After You Read This, You'll Never Ask "What Should I Wear to This Workout?"